A ketogenic diet is a way of eating that keeps carb intake very low, usually below 25 g net carbs per day. For all of us, there comes a day when we want to eat a high carb dish or meal. But will eating carbs make you sick if you’re on the Keto Diet? Sometimes eating carbs while on a keto diet will make you sick. How sick depends on several factors. How long have you been Keto? The longer you’ve been keto, the less the carbs will effect you. What kind of carbs did you eat? Highly processed, crappy carbs are going to make you feel worse. Are your carbs covered in industrially processed seed oil? These oils are highly inflammatory and are going to make you feel worse. When you follow the ketogenic way of eating, the majority of the time you won’t be eating much carbohydrate. Bread, pasta, crackers, beer, potatoes, rice, and sweets are usually off the menu. But because you’re eating satisfying and flavorful protein and fats, your body is nourished, your cravings are reduced, your appetite is decreased, and it’s generally not that big of a deal to not eat carbs. Life is full of variety, though. You may want to have a favorite food every once in a while that you haven’t had in a long time. There may be a family get together and you don’t want to pass up Aunt Mildred’s famous potato soup. Holidays, social situations, date night. I call these Carb Adventures. And adventures can be fun! You may also feel a real need to include some carbs on a regular basis. Intuitively, you may realize that a few carbs here and there will help you feel better, avoid too rapid weight loss and its potential side effects, balance your hormones, or fuel your workouts. Incorporating carbs on a regular or semi-regular basis is known as Carb Cycling and is a totally legitimate way to Keto. There’s also benefit to cycling back and forth between glycolysis (burning glucose from carbs for fuel) and ketosis (burning fat and ketones for fuel.) Being able to easily move back and forth between these two potential fuel sources is a good thing. It’s called metabolic flexibility, and it’s a sign of a healthy body. But will it make you feel sick? If you are new to Keto and have been eating this way for six weeks or less, there is a good chance that eating any significant amount of carbs will make you feel sick. You may feel nauseous, have a headache, feel extremely fatigued, experience bloating, and possibly even slip back into the Keto flu. These symptoms are because your body is not yet fully fat and ketone adapted. While you may be burning fat as your primary fuel source and producing ketones, it takes time for your body to build all of the metabolic machinery it takes to use them really efficiently. We all know it takes practice to get good at something, and that applies inside your body, too. When you add carbs in too early in your Keto journey, you’re sending your body mixed signals before it’s truly ready to deal with them. Will you survive? Of course. You just might be uncomfortable and it might take you a bit to readjust to your Keto way of eating after your Carb Adventure. If you’ve been eating Keto for a couple of months or more, you may not notice any adverse symptoms when you have some carbs. The most likely symptom for the average person will be fatigue, as your body experiences a rise in blood glucose and insulin, followed in short order by a crash, which it hasn’t felt in quite a while. Don’t worry. Your body will adjust and you won’t always feel so tired that you have to lie down just because you had a sweet potato. What kind of carbs are you eating? The second major factor is what type of Carb Adventure you are choosing. Are you planning to binge on beer and pizza or to eat ALL the candy bars or any other kind of refined, processed carbohydrates? These cheap, processed carbs are much more likely to make you feel sick to your stomach. Not only are they highly inflammatory, the refined nature of these foods means there is no substantial fiber, nutrition or other redeeming benefit to balance out the bad stuff. The first time you add carbs, consider starting with a serving of a whole food source of carbohydrate. Sweet potatoes, white potatoes, whole fruit, beans, and maybe even oatmeal are good places to start. If the carbs you eat contain a food that you have an intolerance to, you’ll feel it more than you did before you were Keto. You may not even realize that you have had an intolerance all along. That’s because eating a high quality Keto diet is incredibly healing for your gut. Now that you’ve been Keto for a while, your gut is strong enough to send you signals that some foods are not good for you right now. And trust me, those signals can be very strong. 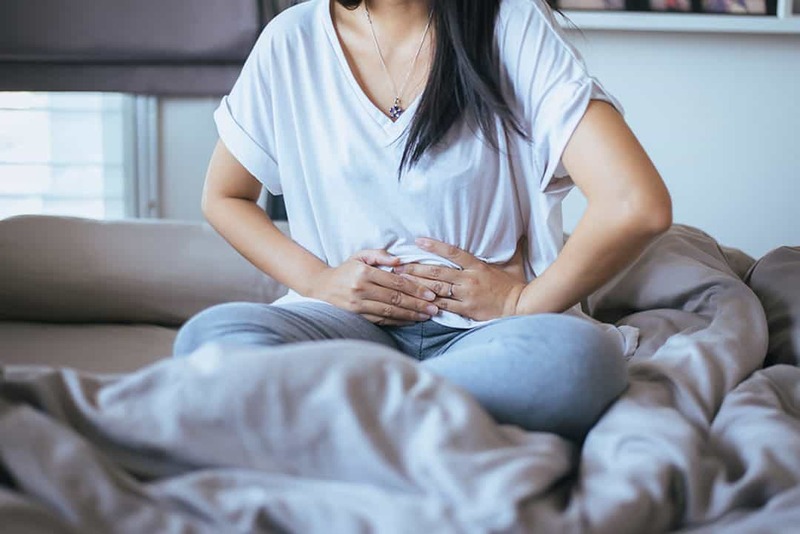 Ranging from discomfort and bloating to skin irritations to vomiting and everything in between, your body has numerous ways to communicate that it would like to remove that food from your diet. Common intolerances include gluten, dairy, eggs, soy, and peanuts. If you suspect an intolerance, you’ll usually find them among things that you eat a lot of. Is there anything that you’ve always eaten a lot of or that you’ve started eating a lot since you went Keto? The good news is, with time, you may heal enough that the intolerance will go away. A little time goes a long way! Are your carbs covered in industrially processed seed oils? If you feel sick after your Carb Adventure, it may not even be the carbs that are upsetting your stomach. Anything that is fried or served in a restaurant is most likely coated with industrially processed seed oils. These oils are highly inflammatory because they are damaged in the high heat and pressure processing that it takes to produce them. French fries, tortilla chips, or anything that is breaded and fried may make you feel pretty bad. Other common sources of inflammatory oils include salad dressings, mayonnaise and many other sauces or gravies. If these toppings are eaten in conjunction with carbs, it may be hard to tell at first which is the culprit for your stomachache. Avoiding processed oils is always a good idea, whether you’re eating carbs or not. If your Carb Adventure includes these oils, just know that there may be some unpleasant side effects. Does eating carbs on Keto make you sick? Depending on your choices and how long you’ve been Keto, you might feel some ill effects from Carb Adventures. But it won’t always be this way, especially if you make good whole food choices. As your body adjusts and becomes more metabolically flexible, you’ll be able to easily move in and out of ketosis with no ill effects. And don’t worry – you won’t undo all your hard work with just one (or maybe more!) Carb Adventure. Keto will still be there, and you can always go back to your ketogenic way of eating. Check out this article on recovering from a cheat day for a few tips to make sure you get back into ketosis fast. When first trying carbs, go slow if you can. Or if you can’t, just know that you might want to be prepared. Adventure awaits!